Mist clung to the steep hillsides closing us in on all sides. From time to time, it cleared enough to offer glimpses of higher slopes dominated by tall pines. For the most part, however, our visibility was limited to a few hundred yards. By the time we were on the water, the early morning snow and mixed precipitation had given way to a steady chilling drizzle that fell on our hats and raincoats, soaked our fleece gloves, made puddles in the bottom of our drift boat, and helped tint the Trinity River that flowed beneath the aluminum beneath our wadered feet. It felt like good steelhead weather. Fifteen years had passed since my one previous visit to northern California, when I spent time on the Klamath River watershed and the national forests of the Shasta-Trinity alps area. On that earlier visit, my wife Deborah and I took a ten-day summer trip to celebrate an anniversary. We visited museums in San Francisco, did a winery-to-winery bike tour in the Sonoma Valley, wandered up the coast visiting state parks, and walked among the giant coastal redwoods whose overwhelming majesty and holiness left us both in tears of joy and awe. We hired a dude ranch to drop us off (on horseback) in the mountains for a two-night camping trip. 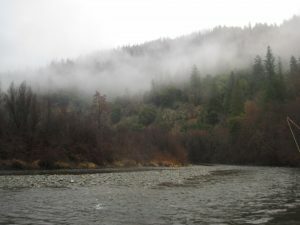 We also spent a day floating down the Klamath River on a “knitting trip” with a professional guide. The knitting trip was a special gift I arranged for my wife to celebrate our anniversary, but it turned out the guide knew a lot about fly fishing, and his drift boat proved a perfect place for me to cast flies for trout while my wife knitted and watched the heron, osprey, and eagles dining riverside. So here I was back again. This time I was with my brother Thanh who lives in Sacramento. Thanh doesn’t knit, but he does enjoy fishing. 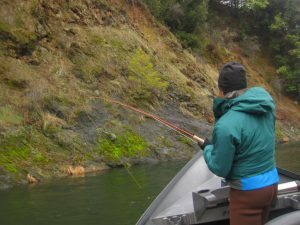 We hired a guide for a day on the Trinity River, a tributary of the Klamath that flows out of a large reservoir, and through rugged Shasta-Trinity National Forest land, before heading west and north up into the Klamath. We met our guide Jon Harrison of Five River Anglers half an hour before dawn in a little riverside town in the mountains. After the usual logistics of shuttling cars between the put-in and take-out point on the river, we climbed into the drift boat and began to fish, casting big rubber-legged nymph imitations. 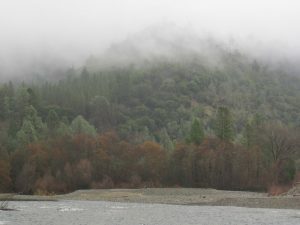 Yet more mist and rain falls on the Shasta-Trinity National Forest. Visibility was low, but what we could see was beautiful. 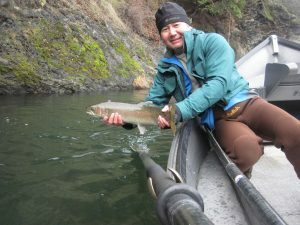 Although the Trinity River does have an excellent fall run of steelhead, the winter run this year has been weak due to a few factors—perhaps the most significant being a drought two and three years ago. Steelhead spawn in fresh waters, but the young steelhead go out to the ocean for two years before returning to where they hatched. Thus a low spawning rate three years ago or a high mortality rate two years ago from the drought would dramatically impact this year’s return. We weren’t sure what to expect. Two hours into the float I hooked and landed my first steelhead. At less than two feet long, it wasn’t huge by the standards of Pacific steelhead, but it was a strong fighter and good leaper, and when we brought it to net I saw it also had the gorgeous coloration of a wild fish. A short time later, Thanh hooked a much larger fish, but lost it within seconds when it made a hard run straight upriver and he couldn’t get the line tight quickly enough. I landed one more even smaller fish, but that was all the action we would see for the next five hours. We drifted along steep hillsides, beneath more towering pines, over shallow riffles and deep holes. A bald eagle flew overhead. Kingfishers hunted from the streamside canopy. The rain let up a bit and the sky brightened, but it never stopped precipitating altogether. We fished through lunch and worked the river hard. We, eager to get the most out of our day—worried that Thanh might have missed his only chance of landing a fish that day. Our guide often rowed upstream against a heavy current to work a particularly good run several times. We saw four other drift boats over the course of the day, but only twice over several miles of river did our guide have to skip a stretch of river he might have fished because it was already occupied. Most of the time we had the river to ourselves. We ran it again. The indicator did make a slight bob in the water. Thanh did set the hook hard. And it was a steelhead. Four minutes later he slid a sleek wild fish just under thirty inches close enough to the boat that Jon was able to scoop it up into his net. As we paddled toward the takeout point, Jon told use we needed to return in November when the steelhead were thick in the river. We told him we’d do our best to oblige.